Fork Chapel derived its name from being located between the Oconee and Apalachee Rivers. The original church was located about two miles south of Greshamville on what is now U S Hwy 278. The church was begun by the efforts and preaching of Rev. Hinton Crawford a successful planter and a zealous Methodist preacher of the old South. Rev. Crawford was a native of Greene County, GA; born December 7, 1798. He married Harriet Talbot, December 12, 1822. Talbot County, GA was named for her grandfather. Rev. and Mrs. Crawford were the parents of 12 children. Six boys and six girls. In 1844 Matthew Winfield gave one acre of land and Rev. Hinton Crawford deeded three acres to the Trustees of the Methodist Episcopal Church for a new building and cemetery. The original church stood three or four hundred yards N.W. of the church that was built on the land given by Mr.Winfield and Rev. Crawford. Records are not available as to the exact date of the original church. The first homecoming day was observed the first Thursday in August in 1912. It started with everyone meeting, carrying tools, and cleaning the cemetery and church grounds and enjoying lunch. Mr. Thomas L. Findley, who was church secretary, prepared a short history of Fork Chapel that he read to those present for Homecoming that year. The following is a quote from his history. In 1860 there was an exodus west. Six families of Fork Chapel moved to Arkansas and left us with only eleven members. The fall of 1868 we had a great revival, about thirty additions. We now have (1912) 117 members. In 1915, a brush arbor was built between New Hope Baptist Church and the Greshamville School house where a revival was held in August of that year. Rev. L. W. Neff was pastor and Rev. Marvin Franklin was the guest preacher. Ten young people joined the church at that time. During the winter of 1915 the membership decided to move the church to Greshamville. Mrs. T. B. Wood and her son J.B. Wood deeded to the Trustees of Fork Chapel church a three-fourths acre lot where the church now stands. The people of the church all went together and gave trees for the foundation timbers and all gave their time to erect the building. The Womens Missionary Society raised $96.95 on a quilt and subscriptions to a magazine. Mr. Will Launius the Superintendant of Sunday School drove the first nail in the new church. Mr. T. L. Findley conducted the first Sunday School. The building was completed except for the ceiling and plastering by August 1916. 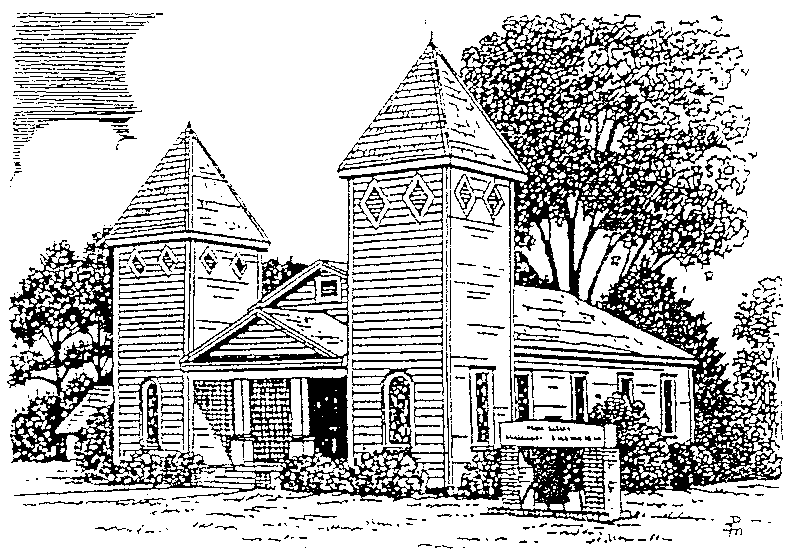 The first church conference held in the new church at Greshamville was January 20, 1917. The church has always had a strong Sunday School. A few records in the 1800’s and early 1900’s show an average attendance of 15 to 20 people with collections of 2-4-7-12-20 cents per Sunday.